A few months ago my younger son bought a new television. He needed a small stand for the tv and his apartment is very small so space is a big issue. I told him we would keep an eye out for something affordable and small to fit the bill. We found the perfect thing! My husband and I were out shopping one afternoon and spotted this cute little cabinet. We took a picture and sent it to our son and he loved it! 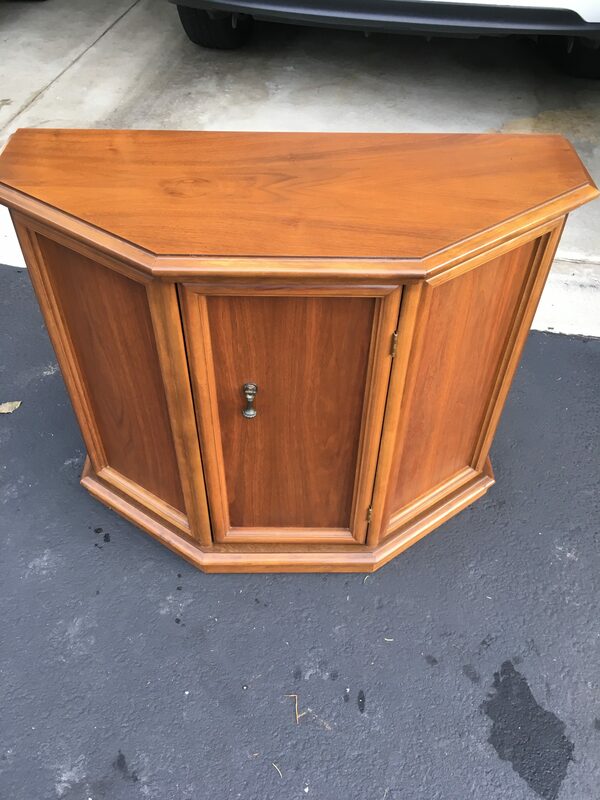 As luck would have it, the cabinet was $55 and was 30% off! So, for $38 we snapped it up and took it home. The cabinet was in great shape and was nice and sturdy. It would make the perfect tv stand as it was narrow, had a flat back and oblong shape that would hold a flat screen tv nicely. Storage is always a plus in a small space and this one had one shelf that would allow for components or video game accessories in his case! I cleaned it up and then covered up the scratches with a light maple stain that matched perfectly. Since the finish was in such good shape I decided not to paint it but to leave it in its vintage condition. It looks brand new! It had a cute little pull on the front and it was also in good shape. I just tightened it up with a screwdriver and it was good to go! It always amazes me how many things out there that have been neglected or kicked to the curb and all they need is a little tender loving care. This little charmer now lives in the Big Apple with my son!